This was one fantastic little RV park. It is ran by a couple, a literal Mom an Pop operation. Their names are escaping me as I type this but they are really two of the nicest folks you could ever meet. They absolutely kept their park clean, the cabins, the RV spots, everything. My Search and Rescue team stayed there during a conference and everybody found it to be very cozy and welcoming. We enjoyed a nice outdoor fire pit, did up a nice barbecue, and told each other tall tales and lies. My team had a great time at this park. I guess if there was even anything slightly negative to say, it was the internet access was a bit spotty. But then again the way I see it, the whole town of Republic had spotty internet and what better way to get away from the rat race than going off the grid for a few days. That's the whole purpose of going to spots like this. I picked this place because of the research I did here on the Goodguys and I just want to aid in that research. I hope to get up there again someday in the future and stay a little longer. The park was a surprise, very appealing rural setting of hills and trees. There was plenty of space between sites. But the best features of the park are the owners. I had a problem with the slideout of my rig, delaying my trip for an entire day. I couldn't get it back in, which prevented me from driving it on the highway. I was stranded. Republic is quite a ways from any RV service, so the help I got from the park was them going above and beyond. I was in good hands until professional help arrived from Colville to get me on the road again. This has become one of my favorite RV parks. My review is based only on the few pull through sites. They are very narrow, thirteen feet, and are set up so the unit next to you pulls through in the opposite direction so your doors face each other. What makes this bad is there is no common area between you, just a white line down the middle. So they took a 26 foot wide space and made two spots out of it. With slide outs you can imagine how close you are. I can now step out my door into my neighbors trailer without really having to touch the ground. So if you are traveling with a rig that has slideouts and looking for a pull through spot, you might want to look elsewhere. My wife and I have snowbird friends who spend winter in Arizona and summer at Winchester RV, Republic, WA. We drove down from BC to spend some time with them. The park was a big surprise to us; large, paved sites, lots of trees, beautiful BBQ area with gas barbecues, tables, fire pit. Washrooms were very clean, and there is a playground for kids. The office also serves as a store with some groceries, beverages and even RV accesories. The town is a 15-minute casual drive, and has some very neat restaurants and bars. Also nearby is the fabulous K Diamond K Guest Ranch, where visitors enjoy the full gamut of ranch life; cow milking, herding cows, trial rides and a whole lot more. 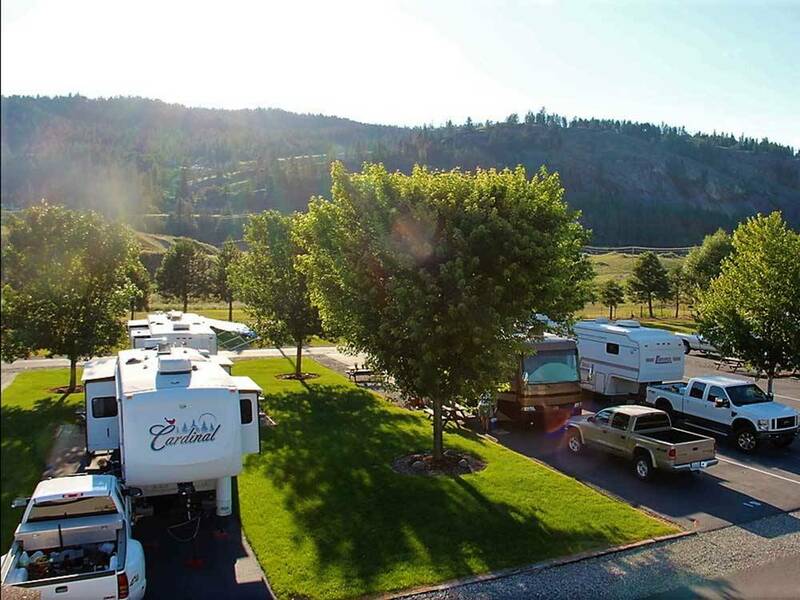 If you're looking for something a little different, with things to do for 2 people or an entire family, book some time at the Winchester RV Park in Republic.